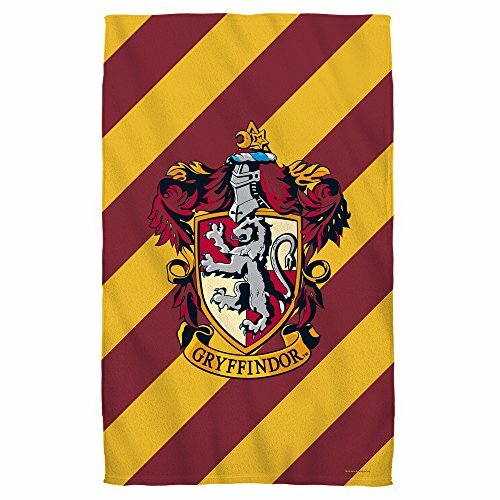 This Harry Potter 30" x 60" beach towel is an officially licensed product and features our cool Gryffindor Crest design. This design is printed on one side of a soft 100% polyester microfiber fleece beach towel. This lightweight microfiber towel is thinner than a standard towel, but it allows for the printing of vibrant colorful designs. Please note that it is natural for some white from the towel to show, as the towel fabric moves. This item is hand-printed in the USA using a dye sublimation printing process that creates slight imperfections over seams and/or folds, which makes each item unique. Cool Gryffindor Crest design (one-sided print). Unprinted side is white.